The Stitch Options dialog, shown below, is used in the Stitch function. The field and options on this dialog are explained below. This value defines the maximum gap between the sheets at which stitching stops. Thus, it is important that the value be large enough to account for any gaps between the sheets being stitched. This value also controls the shortest edge length permissible on the solid or sheet body that results from the stitch operation. Any edges on the stitched solid or sheet body that are shorter than this value are replaced with tolerant geometry. The example below shows two rectangular sheets at an angle to each other. There is a gap of 0.001 between the adjacent edges of the two sheets. If you use a stitching tolerance of 0.001 or higher, then the sheets are not stitched. Instead, the result is a single sheet body with two lumps. 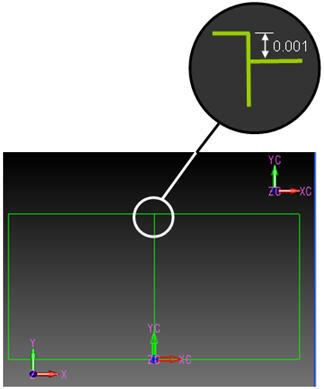 If the tolerance is less than 0.001, then stitching makes the common edge tolerant and makes two tolerant vertices at the ends of that edge. The example below shows two rectangular sheets placed next to each other. An edge from the first sheet is coincident with an edge of the second sheet. However, the lengths of these two edges are not the same: one of the edges is 0.001 units longer than the other. If the stitch tolerance is set to 0.001 or lower, then the resulting sheet will have a tiny edge of length 0.001. 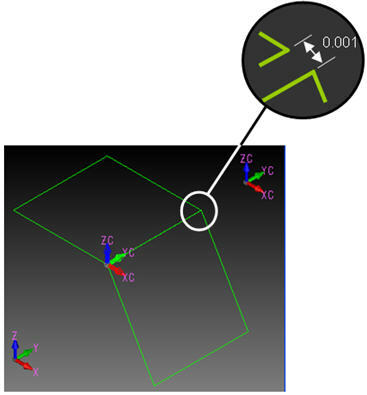 However, if the value of the tolerance is greater than 0.001, then the tiny edge will not be created and a tolerant vertex is placed at the end of the longer edge. When selected, face colors from the sheet bodies being stitched migrate to the stitched solid. If no color existed on the faces of the sheet body, then the sheet body's color is used as the face color in the stitched entity.